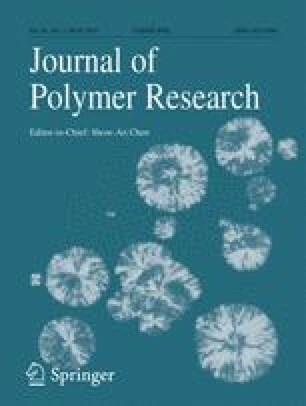 The effects of a combined system consisting of zeolite13X (Z13X) and the α nucleating agent sodium 2,2′-methylene-bis(4,6-di-tertbutylphenyl)-phosphate (NA-11) on the mechanical and crystallization properties of polypropylene (iPP) were studied in detail. The results show that the addition of Z13X to iPP/NA-11 not only increases the mechanical properties of iPP, but also accelerates its crystallization. In particular, at a weight ratio of 4:6 NA-11/Z13X and at a total amount of 0.2 wt%, the tensile strength and flexural modulus of iPP/NA-11/Z13X reach 37.9 MPa and 1896 MPa, respectively, and the crystallization temperature of the iPP/NA-11/Z13X system is 130.2 °C. Furthermore, a comparison of POM and mapping photographs of iPP/NA-11/Z13X and iPP/NA-11 indicate that the presence of Z13X increases the dispersion of NA-11 via hydrogen bonding (as evidenced by FT-IR) and accelerates the crystallization rate. The combined system consisting of Z13X and NA-11, with a lower concentration of NA-11(0.08 wt%), exhibits a similar crystallization ability compared to that of only NA-11 (0.2 wt%). The authors are grateful to the financial support provided by the National Natural Science Funds of China (Grant No. 21776079), and the financial support of the Ministry of Science and Technology of the People’s Republic of China (The People’s Republic of China 863 Program [Grant No. 2015AA034003]). The authors thank Research Center of Analysis and Test of East China University of Science and Technology for the help on the characterization.